Oystertree Principal, Casius Pealer, participated in the first-ever Public Interest Design Week last week at the University of Minnesota College of Design, hosted by PublicInterestDesign.org. 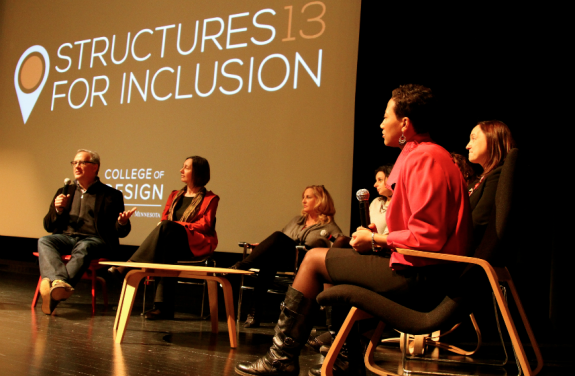 This event brought together numerous other public interest design-related events, including the Public Interest Design Institute and the Structures for Inclusion annual conference. Keynote speakers included Michael Kimmelman, Architecture Critic for the New York Times, and Liz Ogbu, acclaimed designer and Scholar-in-Residence at the CCA Center for Art & Public Life. While at PID Week, Casius coordinated a workshop on affordable housing finance, and also caught up with Minnesota House Rep. Raymond Dehn. Rep. Dehn was elected last November and currently serves on the state’s Capital Investment and Transportation Finance committees, among others. He is only the second architect serving in the Minnesota State House, and previously served as President of the American Institute of Architecture Students (along with Casius as his Vice President in 1996-97). For additional information about Public Interest Design Week, check out these photos posted by John Cary, who coordinated the entire event.